Beautiful young romantic couple standing and hugging on a bridge talking, enjoying amazing New York City scenery. Happy romantic couple standing close and hugging, talking and enjoying amazing Brooklyn Bridge view in New York City. 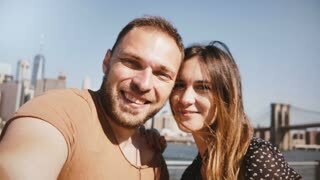 Smiling happy Caucasian young couple stand at epic New York skyline view of Manhattan, kiss and make a selfie photo. Back view of successful businessman standing and enjoying epic Manhattan skyline in sunny summer New York, slow motion. Happy male tourist comes up to epic Brooklyn Bridge river bank fence skyline in New York City, raises arms wide open. Happy excited smiling European tourist woman raises arms at Statue of Liberty in New York on summer day slow motion. Happy smiling European woman with flying hair enjoying famous Manhattan skyline view in New York from a tourist boat.